Last time I was in Tunisia was in 1996 with my parents. This time I was just passing going through the capital Tunis, spending two days before going to Libya and two days after. My couchsurfing hosts took me to a town called Sidi Bou Said where all the buildings were painted in the same white and blue colors. The view of the ocean there was also really nice, with different shades of turqouise blue. On the International Womens Day August 13th there was a massive feminist protest that we joined. What was special this year was that the gay commity had come out with their flags too, demanding that homofilia should be decriminalised. A historical moment for Tunisia, which I celebrated with my couchsurfing hosts and their friends until late night. After a night in Annaba, exploring the Saint Augustine Cathedral, the Lighthouse and the “Corniche” promenade it was time to move on to Tunisia which was just a two hour taxi drive away. When I arrived at the border I was expexting a quick stamp before moving on into Tunisia, but no. After seeing my Libyan visa the immigration boss decided that there was doubt about my visit to Tunisia and that they would therefore not let me pass. After trying to reason with the immigration officer, I was escorted back to Algeria where the Algerian border guards told me that this should not have happened and advised me to stay overnight to try again in the morning. I was given pizza and water and at 9am, after watching the border guards being changed I tried again with my second passport and got in with no questions asked. It did not take long walking along the road before someone picked me up and drove me to the border town of Tabarka where I could catch an onwards bus to Tunis. After spending a couple of hours by the beach and walking up to the fortress for some fantastic views I had quickly forgotten the night sleeping on a bench between the two borders. Tunisia is one of the two countries I have only visited on a family trip (the other one being Romania). 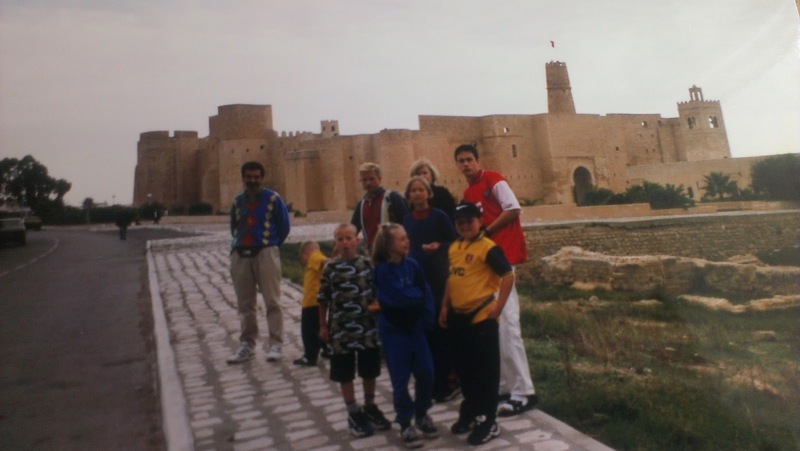 The year was 1996 and we had booked a round trip to Sousse, which is a coast city in Northern Tunisia. The trip started like many other chartered trips, with some lazy days by the hotel pool and the beach in Sousse. From there we travelled by train to Al-Munastir where we visited the Great Mosque, Habib Bourguiba Mauloseoum and the Ribat Castle where parts of Monthy Python’s Life of Brian was filmed. Towards the end of our trip we travelled by bus south to Tataouine and the Tunisian Sahara. On of the highlights there was to visit the Star Wars filming set and get to ride on camels in the Tunisian Sahara. Things that could be bought everywhere in Tunisia was tea, desert roses(stones), bongo drums and dried scorpions that one can have for display (I bought maybe ten of those!). Thats all about my trip to Tunisia for now, but I am sure I will be back for more North African travel sometime soon.